How would it be like to have a butterfly for a tattoo? Tattoo, as defined by Medicine Net is “the permanent insertion of ink or other pigments below the skin using a sharp instrument”. I cringe just by reading its definition. I can’t bear the thought of my skin being pierced just to have the desired designs. Besides, I can’t imagine having a mark that I could not erase with water and soap. But hey, I wanted to have the butterfly design on my skin, albeit simple! Serendipity came while shopping for baking tools needed for New Year’s Eve feast. While waiting for my husband, I decided to go around out and check out new ballpen designs. My eyes almost popped out when I came across a pad of paper that was conspicuously labeled as “Tattoo” piled among children’s stuff in a local store. And the designs were different butterflies of varied colors! Eureka! In celebration of the New Year, we decided to do something a little different. 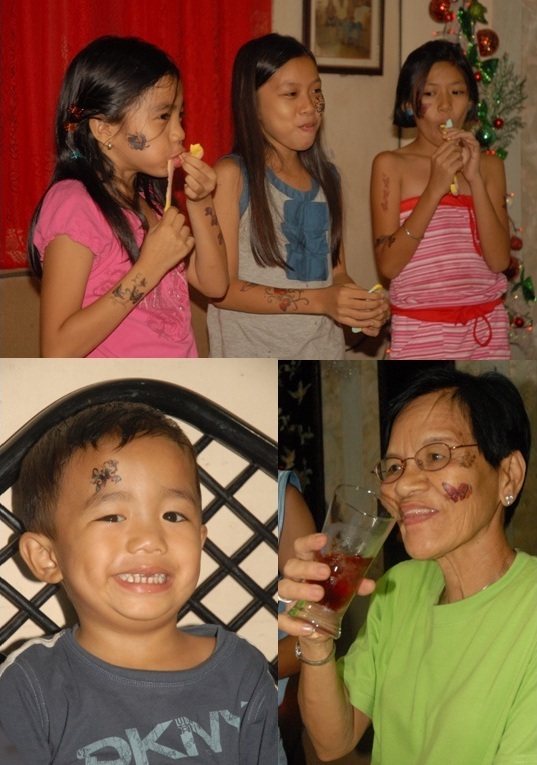 Instead of wearing big party hats, we found ourselves wearing ‘tattoos’. The butterflies were rubbed on kids of all ages – even my Mama got several on her face. I decided to bring the remaining sheets for the Media Ministers Party on the first day of the year. My team enjoyed it as much as the kids! It was so easy to apply, so easy to erase! Thank you, Binoy Magtibay, for taking the pictures of the media ministers! Thank you for capturing how we look like with our fleeting butterflies! They had butterflies on their faces, I had several on my arm. The next time I go back to that local store, I know where I will go first. I will surely get several pads and try new designs. Interested? 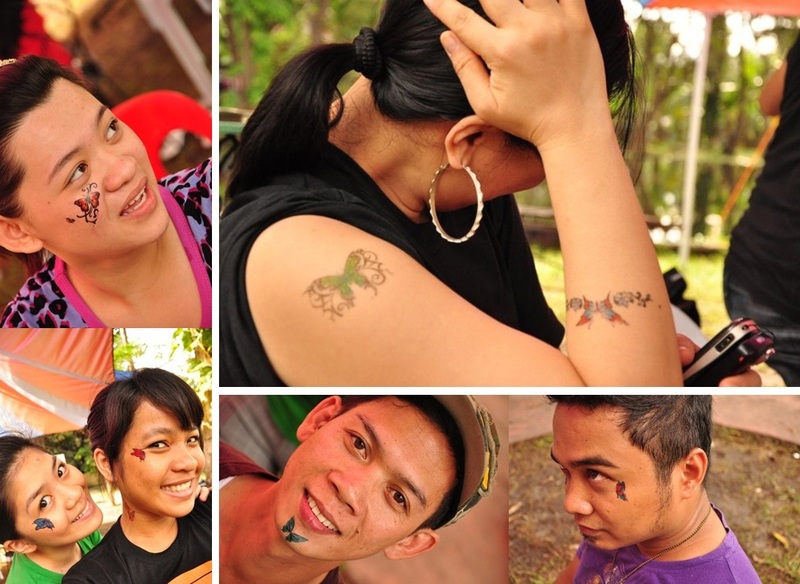 This entry was posted in Celebration, Simple Joys and tagged Binoy Magtibay, Media Ministers, postaday2011, Tattoo.